The sports committee of BU recently organized the university volleyball tournament, Wall-E-Ball 2.0. The tournament happened in different stages. All four houses, i.e. Keen Kickers, Heroic Hearts, Super Spades, and Mighty Boltz actively participated in the tournament. “This tournament was conducted to spot and recognize the talent of the students. 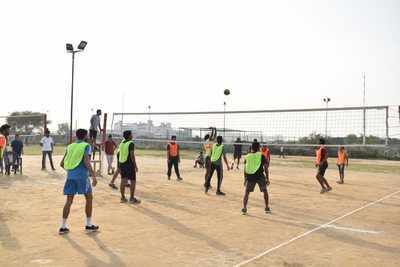 Such activities also act as a stress buster for them and help maintain the competitive spirit among them,” said Kritika Lalwani, sports committee member. A form was circulated the interested members of all the houses to fill up ahead of the trials. The participants were divided into three categories - basic, mediator and expert. Initially, the teams were divided into two groups, group A and group B. Each group had a total of four teams under it. Group A consisted of Super Spades-A, Mighty Boltz-A, Heroic Hearts-B, and Keen Kickers-B; and Group B consisted of Heroic Hearts-A, Keen Kickers-A, Mighty Boltz-B and Super Spades-B. Team A consisted of all the experts, the ones who had knowledge about the game and had already played in the past whereas the people in Team B had to give trials to get selected. Eight people got selected in each team, six students as main players and two students were kept as extras. Four matches were conducted before the semi-finals and all the houses won points, except Keen Kickers. Semifinals were conducted on 27th March. The first set of the match, which was between Super Spades-A and Keen Kickers-A, was won by Super Spades by 5-0. The second set was won by Mighty Boltz -A against Heroic Hearts-A 3-2. “Last year it wasn’t organised properly and participants had to form their own teams. This time everything was properly arranged and scheduled. The presence of all the houses has made such tournaments successful. Although my team didn’t win, it was a fun,” said Mayank Tripathy, member of Heroic Hearts. Everyone watched with bated breath as Super Spades-A emerged triumphant in the final with Mighty Boltz-A. “The level of competition was exceptional. The presence of both the sports officers of BU added to the excitement. It was a very close match,” said Kaashyap, captain of the volleyball team.